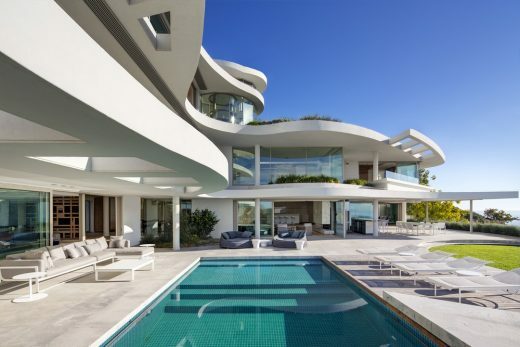 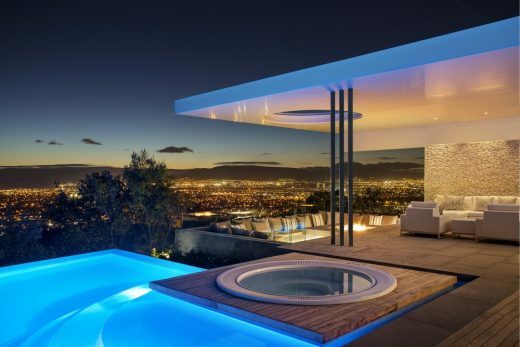 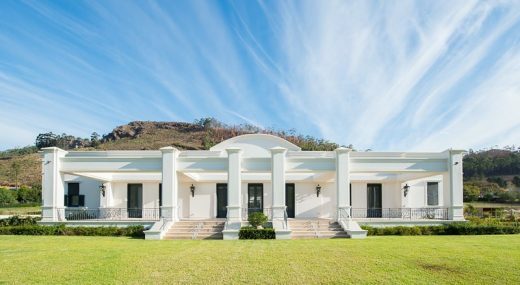 The Johannesburg home of an international businessman has been perfectly expressed to suit his passion for African art and his love of entertaining. 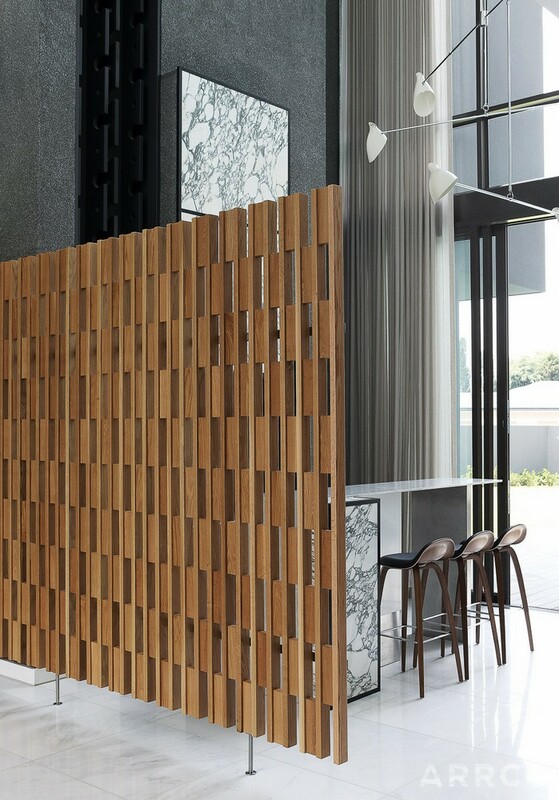 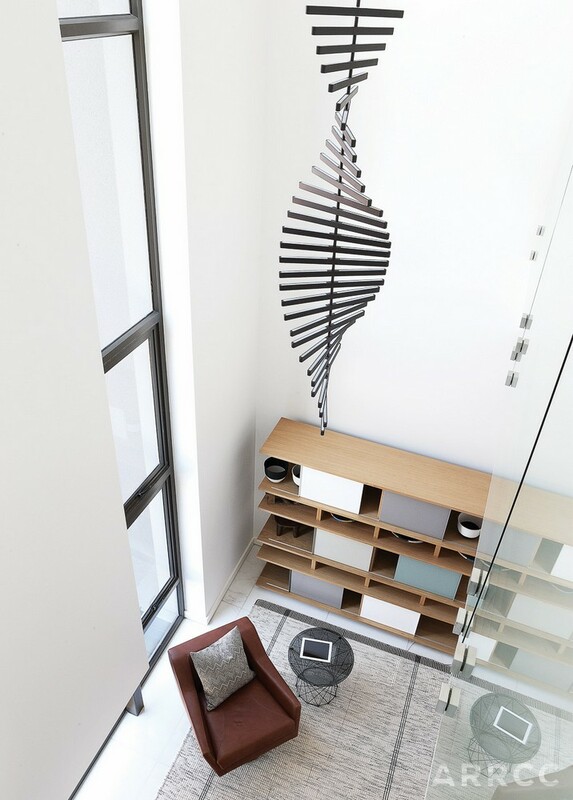 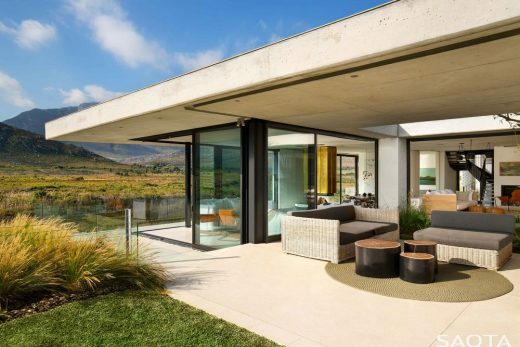 Designed by local architecture firm Cimato Moroldo Architects, its interiors were brought to life by leading Cape Town-based interior studio ARRCC, with contemporary furniture and objets d’art by design studio OKHA. 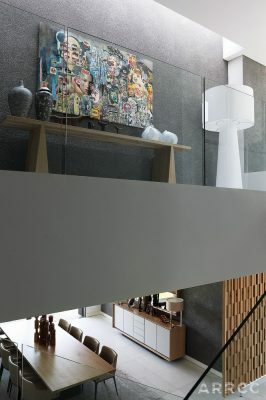 Says ARRCC director Mark Rielly, ‘This house had to be as multi‐functional as possible, so that it could adapt to family holidays, feasts with friends, and more formal moments when hosting executive guests.’ Mark and his team achieved this by maintaining an uncluttered thread throughout the five‐bedroom home, while linking spaces that could be used simultaneously. 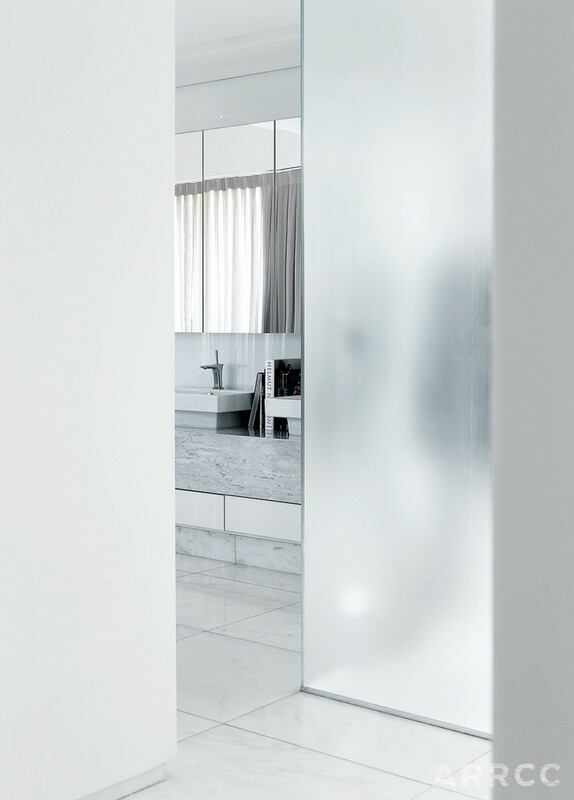 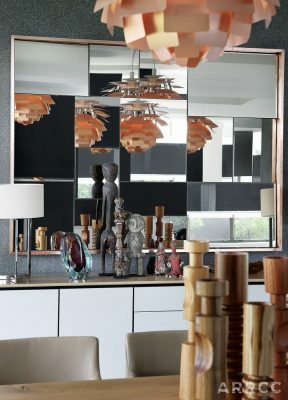 The brass‐clad Solar Mirror designed by Adam Court of OKHA greets one in this space. 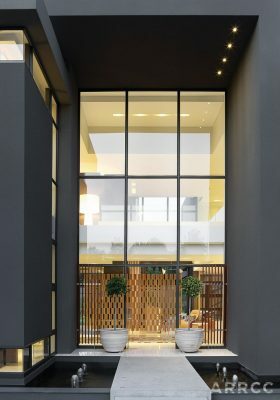 Its reference to the cosmos that connects the universe adds to the welcoming visual language. 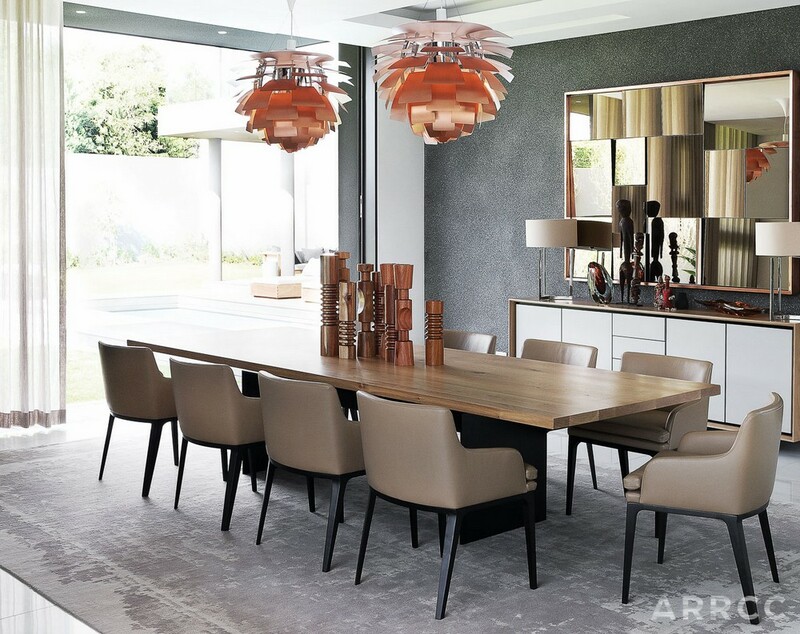 The dining room creates instant attraction with its copper PH Artichoke lamps by Poul Henningsen for Louis Poulsen, reflecting mahogany Mojo candlesticks on the dining table. These, along with the carved tribal-figures standing in front of the faceted mirror, form part of the owner’s African art collection, curated here in such a way that they bring personality to the dining area. 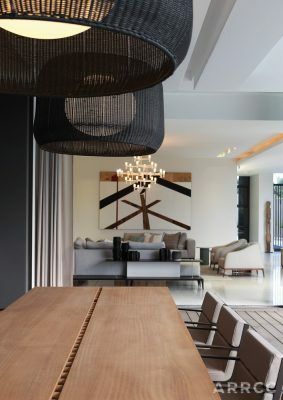 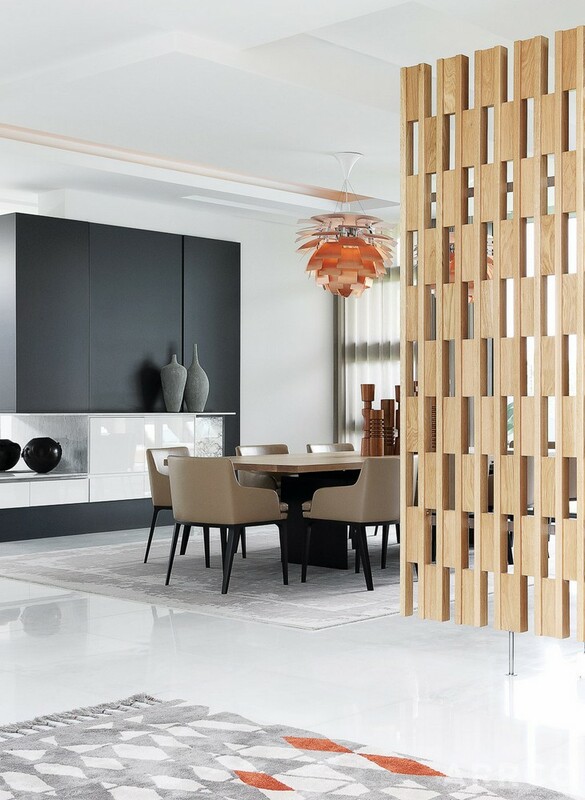 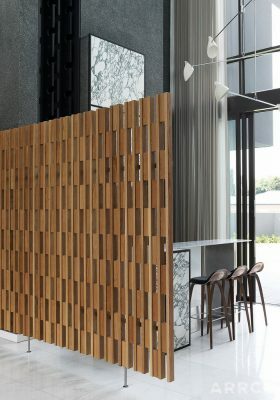 The bar displays its persona through a David Weeks hanging mobile chandelier presiding over the double‐volume space, where a highly textured grey crystallite wall acts as a delineator, and brings an element of the dark exterior walls into the home. 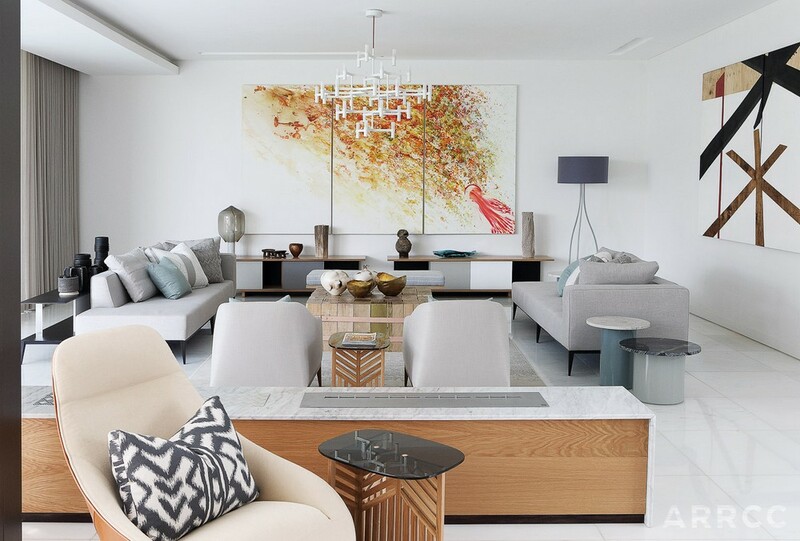 In the formal lounge, OKHA’s clean‐line, pure‐form furniture pieces create an environment of easy‐living elegance that epitomises African luxury. 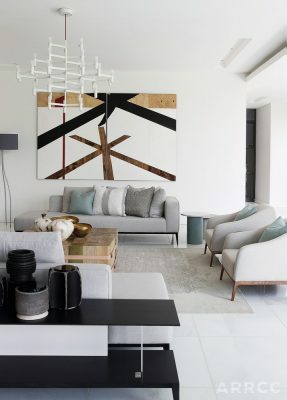 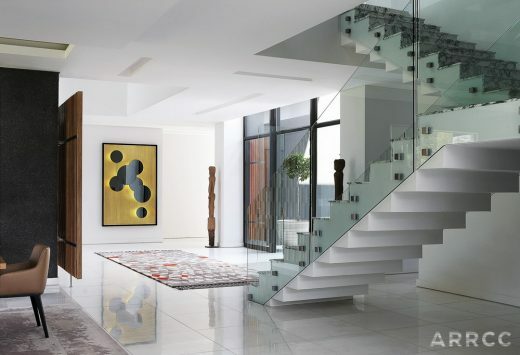 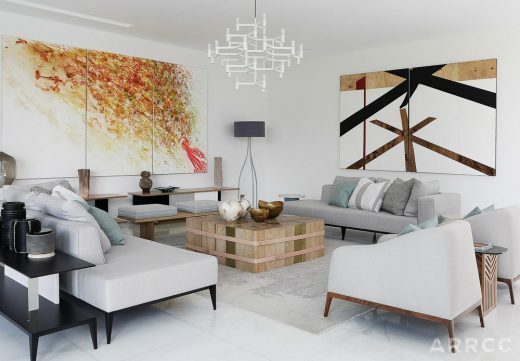 Two large‐canvas artworks hold the room together, accenting its lines and forms. Charged with poetic mystery, the subtly coloured triptych by South African Penny Siopis offers an element of movement in the otherwise formal space, while the stronger lines in the work by Burundi‐born Serge Alain Nitegeka offer a dynamically bold and overtly graphic attraction. 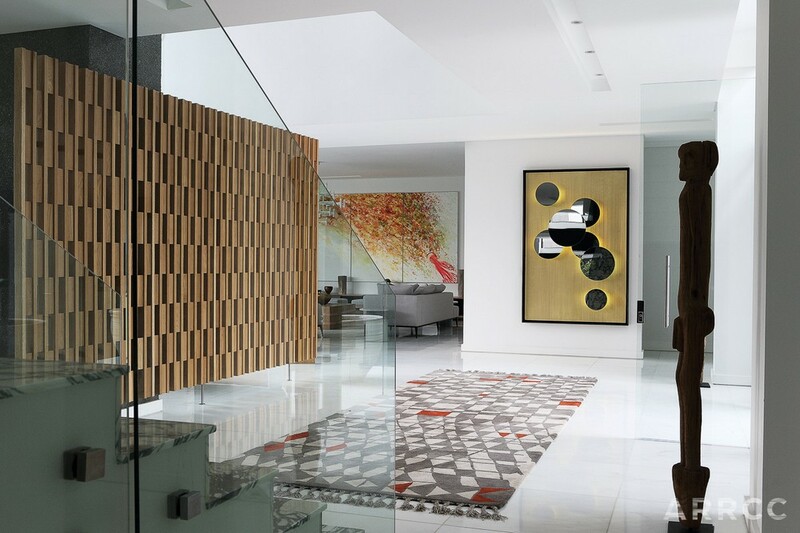 ‘The tension between these two works enlivens the room,’ says Mark. More casual in its function, the family room is nevertheless carefully considered, with coffee tables custom designed by OKHA. 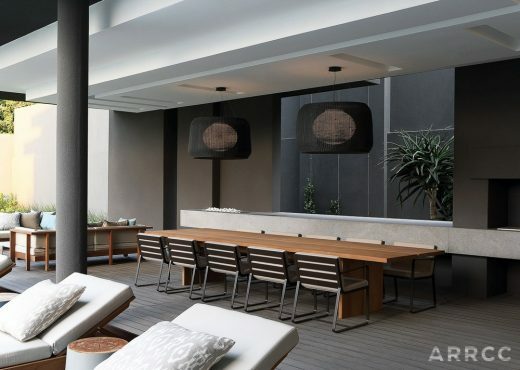 Powder‐coated steel legs with acid‐etched and sand‐blasted marble tops come together as two separate yet connected circular spheres that allow the contoured sofa to mimic their fluid edges. 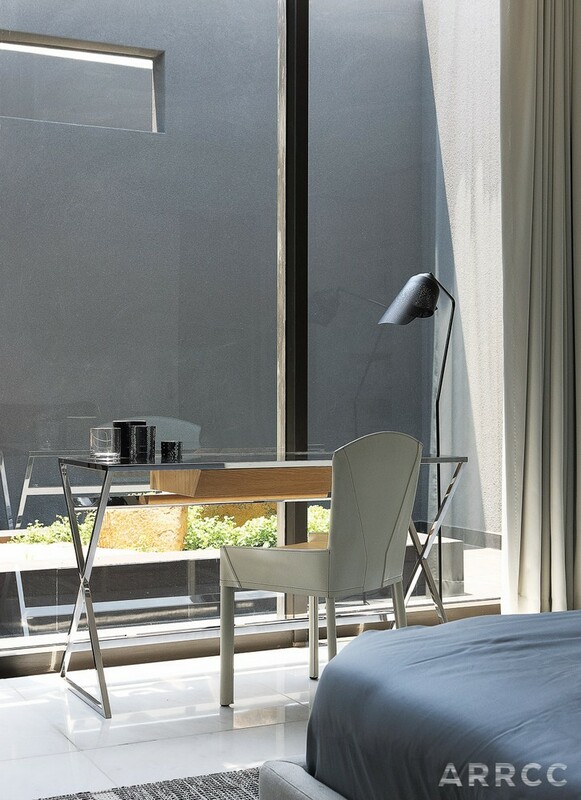 Maintaining the muted colour palette of the home, each item of furniture is expressed as an artwork of high quality refinement – a nod to OKHA’s respect for traditional craftsmanship and material, says the design studio’s director, Adam Court. 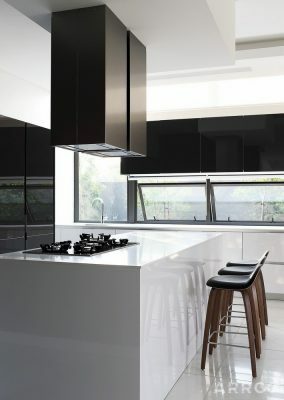 The kitchen adjacent to this family room is replete with monochromatic, functional design, with only the necessary equipment in sight, as all peripheral elements are cleverly tucked away through careful design considerations. The garden, deck and splash pool offer an entirely alternative living environment, with dining, lounging and barbecuing needs all catered for through the clever layout of tables, sofas and deck chairs. 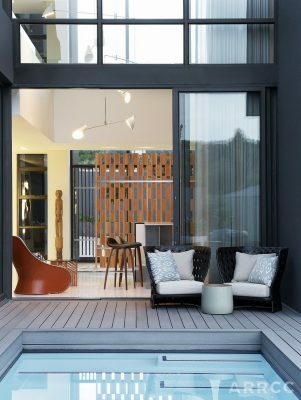 ‘By creating entertainment pods outdoors, we’ve cosied up the deck, allowing the owner to entertain friends and family in a very unique way,’ Mark explains. The upstairs landing further conveys the artistic bend of this interior, a Big Shadow standing lamp by Marcel Wanders for Cappellini and collage artwork by Asha Zero filling the volume that leads to the bedrooms. 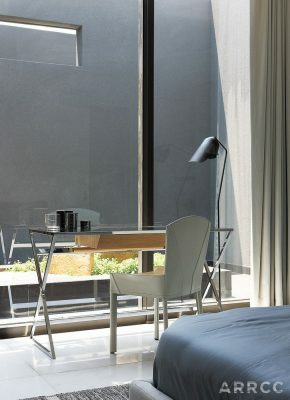 These en‐suite bedrooms offer individualised comfort, each one furnished with a different accent colour. 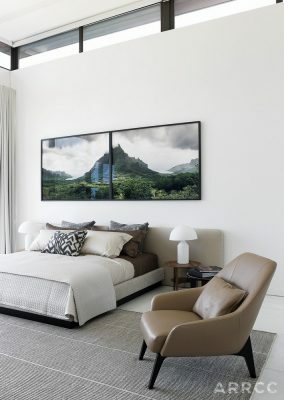 In the master suite, a painting by Conrad Botes brings brightness to the predominantly grey room. 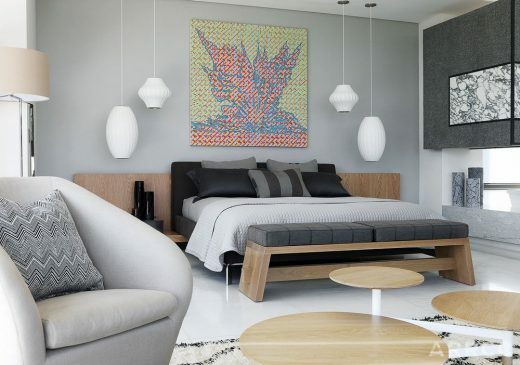 Textures of wood, marble, wool and ceramic further enliven the bedroom. 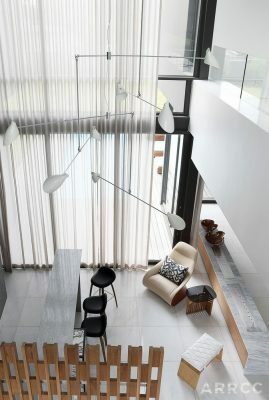 ‘Besides being a space for entertaining, this is a house in which to lie back, relax and just enjoy being home,’ says Mark.